A massive board resembles a parquet according to its external characteristics and acts as one of the most durable materials used to decorate the floor covering. The array is different from the parquet in structure, because the first one is solid wood. In addition, it is much more durable and more practical, which is reflected in the high resistance of the material to external environmental influences, heavy loads and polishing. A massive board during production acquires ridges and grooves at the edges, which ensures a tight and fast joining of products. The width of the canvases can be equal to the figure ranging from 12 to 20 cm, while the length - from 50 cm to 3 m. Products are chamfered on the outside. They are necessary in order to remain a gap between the joints after installation. It is a compensation groove that eliminates the deformation of the boards when changing temperature and humidity indicators. On the back of the webs there are longitudinal cuts and transverse notches of minor size, which reduce the load on the product and reduce the stress on the fibers, which eliminates the possibility of their destruction. 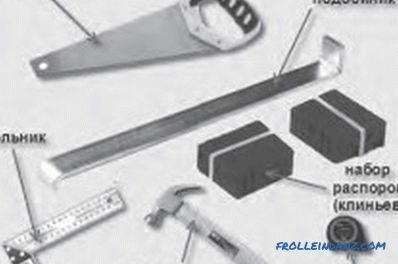 Tools for laying solid wood. The array, like the floorboard, should be laid on a well-prepared surface; it should be tough, reliable and level. The floor should not have high humidity. Thus, the moisture indicators screed should not exceed 6%, whereas for concrete floors, this figure should be equal to 4%. It is recommended to lay a massive board after the completion of assembly and construction and finishing processes, which will exclude accidental damage to the material. An early installation of ventilation, heating systems and the installation of window units should be carried out if necessary. The next step will be the acquisition of the board, because the quality of the work depends not only on compliance with the technology. You can prefer an array, based on the wood of exotic foreign or domestic species. Both of these options can be considered successful for the arrangement of flooring. If you want to make the installation of the coating in bright colors, from the European species, you can choose a nut or beech. Among the exotic, an excellent option for a light coating will be a material based on Mersava or Meranti. You should not choose pink wood species, among which cherry, as well as sweet cherry, if you are not ready for the fact that you will have to constantly take care of the coating and analyze the level of humidity. A plan for mounting a solid board. 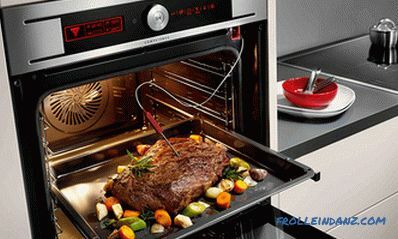 The board, which is made from a range of light wood, does not tolerate "drying out" the heat, however, it cannot be mounted in conditions of high humidity either. If the massive board is supposed to be laid in a room, the conditions of which are characterized by frequent and severe changes in humidity and temperature, it is recommended to prefer the species, the wood of which has a large amount of oils. Among them, oak, lapacho, merbau, etc. It should be noted that some wood species react differently to changes in external indicators. Therefore, if necessary, lay a massive board that is more resistant to deformation, it is worth buying a material based on oak, not beech. 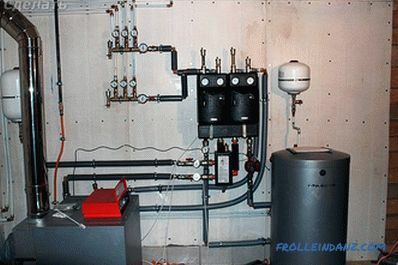 The choice of breed will also depend on the purpose of the installation. So, in the corridor, hall or hallway, where the load on the fibers of the material are elevated, it is preferable to install hardwood, such as: oak or ash. In terms of guest rooms and bedrooms it is permissible to use an array of any breed. The massive board must be prepared before the beginning of the process, for which it needs to be unpacked in a week, which will allow the material to pass the acclimatization stage. In this state, the board should be left in the room in which it is intended to carry out the laying process. However, it is better not to lay a massive board on the floor at this time, since then its lower surface will be devoid of air access. In order to avoid this, the material must be laid on a stand. 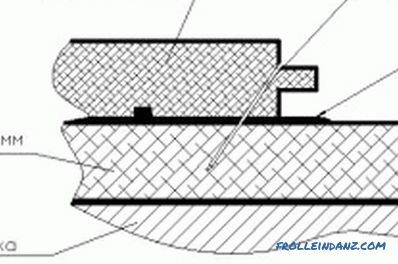 Density of the plates should not exceed 5-12%. This will eliminate the likelihood of changes in the linear dimensions of the wood after the completion of the styling process. Laying a massive board on a concrete screed. The massive board is laid according to the principle used in the installation of parquet.The array can be strengthened with screws on any surface from the side of the spike. The blades must be carefully joined by means of wedges. The distance between the wall and the canvas should be equal to 7-10 mm. The installation of the first row of canvases must be carried out by applying the groove to the wall surface. The fastener is installed on the front side, and then covered with a plinth. 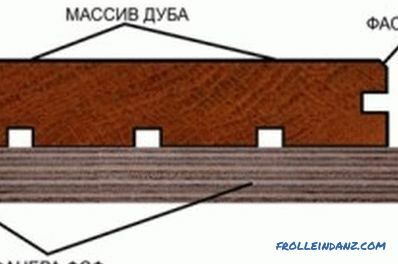 When laying a wide board, the fastener location should be masked with a cork, the color of which should correspond to the basic tone of the pattern of the array. Installation should be done in the direction of sunlight, that is, perpendicular to the window opening. A massive board can be laid on the surface of a reinforced concrete slab, represented by a screed and plywood backing. In addition, laying can be done on the screed and logs, as well as on the wooden floor. The latter option can be represented by chipboard plates, lags and plywood. Installation can be made and a floating method, which involves the use of screws and brackets. The massive board will fall perfectly on the adhesive backing. If a massive board is supposed to be laid on a concrete surface or a cement-sand screed, then special glue should be used, its composition must be resistant to temperature differences, then it can also be used when mounted on a floor covering equipped with heating . Layout of a massive board on logs. Before installation, the surface of the tie must be checked for damage. To determine the moisture level of the screed in its different parts using a punch, you need to provide holes. Humidity indicator not exceeding 6% can be considered acceptable. However, at higher rates of moisture, the concrete must be protected with a layer of waterproofing in the form of a film. 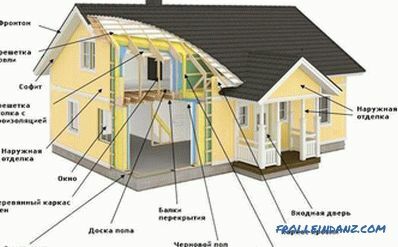 In the conditions of the Russian climate most often carry out laying of a massive board on plywood, equipping an additional layer of waterproofing. Initially, the plywood sheet must be cut to get elements with dimensions of 50 * 70, or squares with a side of 50 cm. After the sheets have to be laid on mastic or glue and strengthened with dowels. For each element of plywood will need to use 6 fasteners. The moisture level of plywood should not exceed 10%. As soon as the plywood base can be equipped, an array should be laid on the surface of the rough floors. For fixing it is preferable to use a two-component glue. 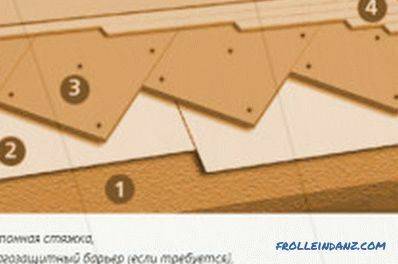 With a step of 30 cm you need to implement lateral fasteners using pnevoshpilki. The surface of the topcoat needs to be initially cleaned and then sanded. If the laying process was carried out correctly, then a thorough grinding is not required. 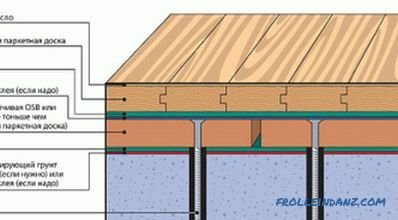 If the laying technology is violated, which may imply screed contamination, a high moisture level of the base, displacement of the plywood sheets, deformation of the floor may occur and even change the color of the wood fibers during operation. Layout for laying solid wood on a plywood base. A massive floor board can be laid on a wooden floor, the state of which should be tested for durability before starting work. 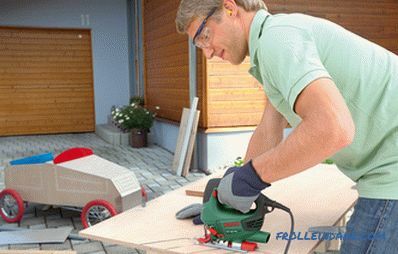 However, it still needs to be prepared by using a belt sander, which has an abrasive tape in its arsenal. The purpose of such work is to maximize the leveling of the surface and removing from it extra layers of paint or paintwork. Laying should be carried out only after the surface has been cleaned. The massive board should be laid, having in the same direction, as an old covering. The surface of the subfloor must be laid with plywood, which must also be sanded. The laying of the array can also be carried out in a floating way, which implies a separate fixation of the material that will not be connected to the base. Pairing must be done between the dies of the topcoat. Such laying allows you to get a floor that will be able to withstand heavy loads and moisture drops. This is due to the fact that the finish coating is not associated with the subfloor. In order to minimize the change in the linear dimensions of the boards, the fasteners must be made by self-tapping screws, which have a protective anti-corrosion layer. Array stacking can be carried out on brackets. This method allows you to save and has additional advantages in the form of ease of work, environmental friendliness (in the course of laying impregnation, primer and adhesive composition is not used), high speed of installation. If staples are used during the installation process, the topcoat is more resistant to impact. If necessary, it will be possible to make a local or large-scale repair without completely changing the coating. 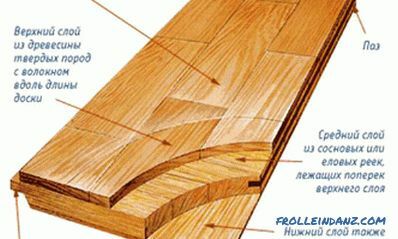 Types of solid wood flooring. An array, like a parquet, can be laid on logs. This method eliminates the use of cement formulations. With his help, you can compensate for the height of the floor, creating small podiums in the space of living-studios or commercial premises. The basis for the log will be timber. Laying work should be preceded by waterproofing of the floor with penofol, which polyethylene is capable of replacing. Laying the lag should be done parallel to each other. 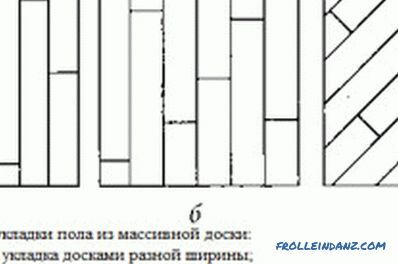 The first logs should be located at opposite walls, after between these elements it is necessary to tighten the threads, the interval between which should be equal to 1.5 m. The remaining logs should be laid along each thread. The hollow space between the bars must be filled with a heat insulator. 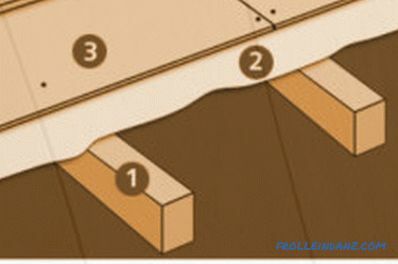 After the lags, you can begin to fasten sheets of hardboard, only then it is permissible to begin to work with wood. Among the many mounting options for an array is mounting on an adhesive backing, which turned out to be even more affordable with the appearance of elastinol. This material is an adhesive backing that is characterized by thermal and noise insulation properties. The joints of the board after installation are almost not visible, since the adhesive composition guarantees high-quality grip. Using the substrate reduces the likelihood of swelling boards. On concrete, the substrate must be laid, turning its sticky side to the canvas, only after you can proceed to the installation of the array. The massive board is not only durable, has a low thermal conductivity and is characterized by environmental friendliness, but is also capable of providing sound-proofing properties to the floor. The life of the material will depend on the care and can reach 120 years. During operation, the floor should not be exposed to excessive moisture, as regards not only the external conditions in the room, but also cleaning. You can select the array installation method based on the material that underlies the rough coating, the preparation of which should be given great importance.